For the last few months, certainly at the very least since I arrived back in the SW from Huddersfield, I haven't clapped eyes on a single step entrance offering from First within Plymouth. With the K-LAEs now gone, along with P568 EFL on her move to Truro, and K801 ORL's subsequent withdrawal from service, K803 ORL has been the only Plymouth based vehicle which is still aged enough to have some steps to climb before you get the chance to lounge in comfort upon her duel purpose seating. As I've mentioned previously though, good old 34003 spends nearly all of her time stowed away in Dartmouth, where she lives out her final days operating the Dartmouth Academy school bus, across the Dartmouth Higher Ferry, and therefore never sees any use within her home city. But of course, the schools are now on holiday, and hence K803 now appears to have been allowed back! It's actually quite strange seeing a standard in service step entrance vehicle in Plymouth these days, it's certainly a rarity, and K803 ORL stood out like a sore thumb as she trundled up Royal Parade; making all the right noises! Lets hope she hangs on a little bit longer, I'd definitely like one last blast before she's silenced, possibly forever...but time must now surely be short for the 20 year old Northern Counties bodied beauty. This week's SoS comes slightly delayed, with these photos actually being taken during the previous week. This period saw Military Road, aka the cliff road along Whitsand Bay shut, due to some serious subsidence of the road, leaving holes of some 10ft in depth across the breadth of the road. This meant a diversion via the old 80B route, taking the buses along the B3247 and down the infamous Hounster Hill, through Millbrook Narrows. No First services have used this road for some time, since Olympian C412 HJN disgraced herself on a school run, unable to make it up the hill with her capacity load; but it has been some 6 years now since First ran regular public services via this route. Therefore it seemed a worthy use of time to go down and get some photos of various buses squeezing their way through, made even more nightmareish by the sheer volume of traffic using the road, because of course, there was no alternative! This can in particular be seen within the photo below of the CJ Down Volvo trying to negotiate its way through! Traffic has now returned to Military Road after a very hasty repair, with services now operating the normal route. Today (Friday 19th July) saw the very first Megabus Gold service depart Plymouth, with one of the brand new, extremely impressive looking, Van Hool TXD29 Astromega. The honour was bestowed to SF13 FMP to work the 1635 Bretonside to London Victoria, who decided to disgrace herself temporarily with a faulty rear passenger door, delaying her debut departure! She would then work up to Scotland in 'Sleeper Mode' on arrival at London Victoria. With thanks to the very cheerful Scottish crew aboard, they allowed me to jump on board and admire her from inside, and it must be said, these really are top spec! 2+1 seating is seen throughout the coach, with a table available at every seat, along with plug sockets. Wifi is also provided free of charge, but what is really nice to see is a return to having a host/hostess aboard for the journey serving complimentary refreshments, a real step forward! The layout though, although very impressive, does appear very 'messy', but undoubtedly this is required to ensure the maximum amount of beds can be accommodated. Interesting also to note that the seats at the front on the top deck are faced away from the glass with no top deck forward view. But of course, having a bed against the window could be very hazardous! As can just be made out, the bedding equipment appears to be stowed in the luggage compartment at all times rather than being taken off and put on the coaches at their respective departure points. All this luxury actually comes at a very reasonable price though. After checking yesterday to see how much a I'd be paying for a seat on that particular journey, it was a mere £16 all the way to London, an absolute bargain! We shall soon see if this is a bit of an introductory offer, or whether indeed that price will be maintained! 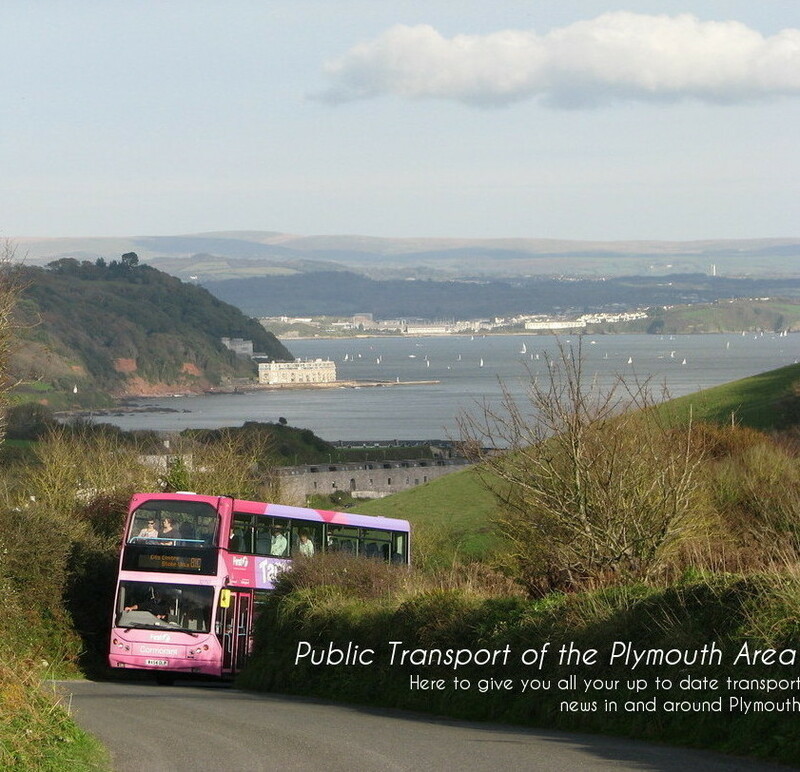 With the recent filming going on in the villages of Kingsand and Cawsand for the new Mike Leigh film, documenting the life and work of the artist JWM Turner, a shuttle bus service has been put in place to link the villages with the storage site at Maker. For this job, they have not opted to draft in local operators, but instead have hired in two Ford Transits (with drivers) from MK Travel of Tonbridge; just South of London! Although the company do appear to specialise in Film and Television related work, I fail to see how this is of any real asset considering the journey is a matter of minutes in length, with only a handful of journeys required per day, but evidently, it must be worth their while considering the distance involved. They must therefore of course be paying quite a premium considering the sheer distance from their operating base, as well as other costs involved, such as booking hotels for the drivers, and possibly even maintenance away from home. All things considered I'm quite surprised that it's worth all the extra cash they must be paying for the benefits they bring, but then again, the hire of a couple of minibuses is most likely a small drop in the ocean for such a big budget industry. 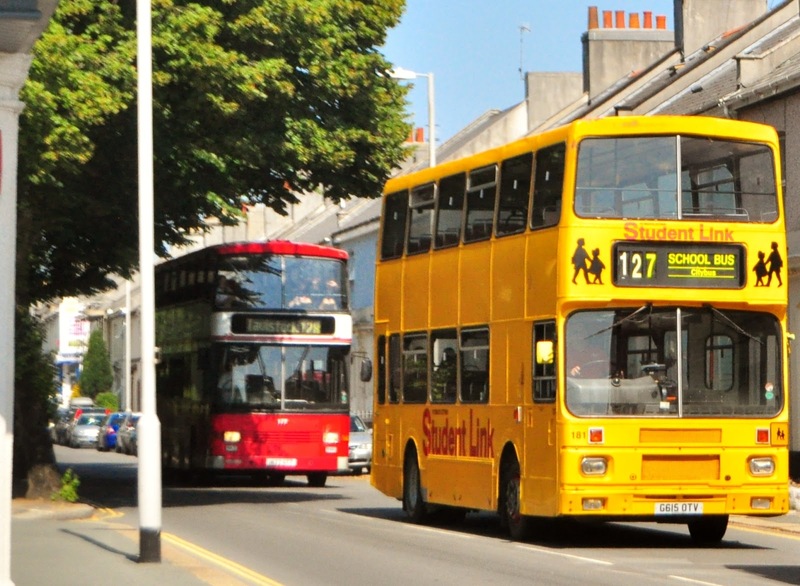 Yes it's that time of year again when we say a fond farewell to Plymouth Citybus' Volvo B10Ms! In all seriousness, it really does seem that this year will finally be the final year of the yellow beasts dominating the school gates. Indeed it appears that there is now only one left still playing its trade, this being G615 OTV, along with H177/8 GTT also still plodding along in the old standard fleet livery. All are expected to be withdrawn shortly, but there is the possibility the H regs will hang on for slightly longer, we shall soon see! With the brand new Enviro 400s about to be delivered, and with the recent influx of even more B7TLs, there really will now be the capacity to plug the gap that the B10Ms will leave. A shame that after a span of just under 30 years the B10M decker will no longer be a common sight on the streets of Plymouth. Although they've never had such a passionate following as the stalwart Plymouth decker, the Atlantean, the B10Ms have nonetheless proved themselves time and time again; and although they never quite had the character to match the Atlantean, they have no doubt created and played a part in many great memories over their lives. The final day as ever will be the last Friday of the school year (i.e. this Friday!) so get them while you can! The Cremyll Ferry company has recently sourced a replacement for the Tamar Belle which has now been sold on, and is now at work on the St Mawes to Falmouth service, very close to her previous operating area in the Helford Passage, whilst named 'Queen of Helford'. The new vessel, Island Princess has been bought from Paignton Pleasure Cruises, who operated her on the Torquay to Paignton service, but prior to that, worked as the 'Solent Princess' whilst based on the South Coast. Island Princess can carry up to 70 people, so should be able to cope with loadings out of the peak months, although her large open deck space doesn't necessarily lend itself to operating during the winter months, and hence, it has been proposed that Northern Belle will undertake her annual refit during September, rather than the usual November-January period, in the hope it will be slightly warmer! She will of course also be used when problems occur with the Northern Belle, although thankfully they are generally few and far between. The vessel has now been painted into the Cremyll Ferry livery after previously being plain white. Photos come, with thanks, from Paul Burch.